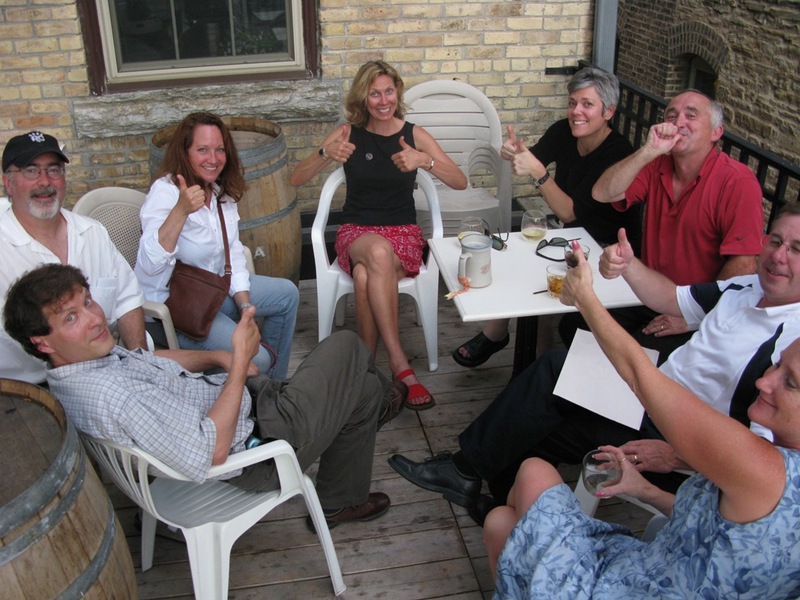 The sidewalk dining ordinance passed back in May but at last night’s City Council meeting, the Council unanimously passed the permit fee structure: no cost till at least next May, 2009. Yay! Community Development Director Brian O’Connell said to me that he’ll have one of the City’s summer interns visit all downtown establishments in person Real Soon Now with a simple permit form for them to sign. Left: After I left the Council meeting, I found some of the NDDC board members at the Cow, socializing a bit after a meeting. I told them the news. See the happy thumbs. Center: Division street could soon be looking like 14th Av. SE in Dinkytown, in front of the Loring Pasta Bar. 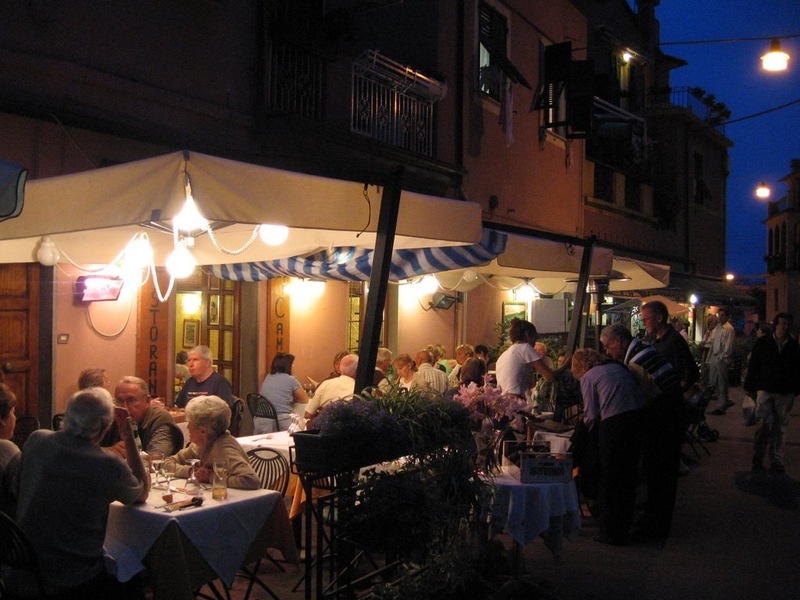 Right: Eventually, sidewalk dining could spill out onto Division St. like this restaurant in Monterossa al Mare in the Cinque Terre region of Italy. 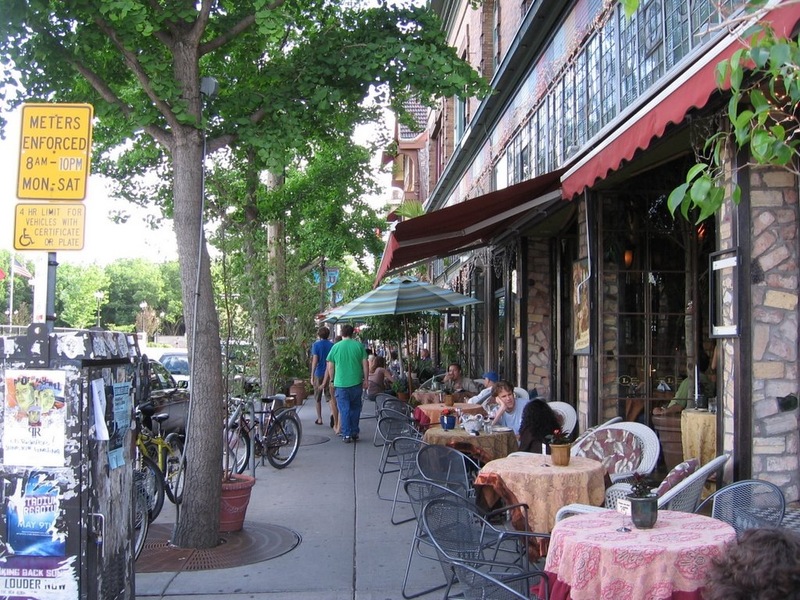 So which Northfield eating and drinking establishments are likely to offer sidewalk dining yet this year? Dave Hvistendahl, owner of Froggy Bottoms, deserves credit for raising the issue in 2005 when he successfully petitioned the Council for a temporary dining permit on the Riverwalk adjacent to his pub. Both you and Hvisty deserve much credit for keeping this initiative off of the dust-gathering shelves and in front of the eyes of the decision-makers. The NDDC’s E R Team, Joe Grundhoefer, Keith Covey, Roger Kelm and the Summas, also worked hard and systematically on this issue for many years, gathering information from other cities and fine-tuning the details for our unique community. Finally, although Council Member Pokorney and I may have some philosophical differences on the private sector’s use of public spaces, he, too, refused to let this one go quietly into the darkness and deserves specific recognition for his efforts on this matter. But let’s not get too hung up on the names of the individuals involved. Let’s note above all how long the process took to achieve some results, how many different people had to take a shift in pushing this stone up the hill, and how, through what could be considered a public-private compromise, their efforts were ultimately rewarded. Perhaps other small groups of people, working to push some other stone against the forces of nature, can find some hope, and tips, in this example. Finally, let us remember that this process continues. We should follow the implementation, gather feedback from the businesses affected by the new ordinance, note the anticipated “sunrise” that follows the “sunset” of this ordinance next Spring, and be alert to any additional ordinances that may be proposed to change the way that the private sector may share the public space. Our work is never done.